New in 2018, anglers can submit their application and photo(s) electronically! 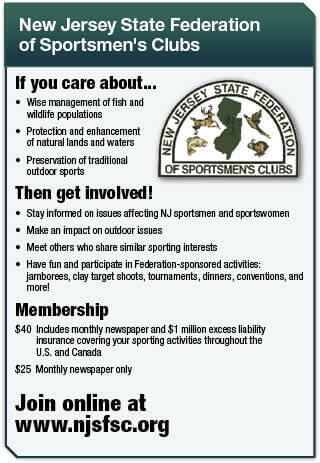 Program rules and steps to enter are found here http://njfishandwildlife.com/skflang.htm. Anglers qualifying for a Skillful Angler award receive a certificate along with a Skillful Angler patch as a testament to their achievement. The Program has three main divisions: Adult (for anglers age 16 and older), Junior (under age 16) and Catch and Release (based on length). A clear, side-view photo that allows accurate species identification must be included with each application. Additional good quality (and high resolution) photos with the angler are welcome and appreciated. The Skillful Angler Program recognizes different levels of fishing expertise. An angler who submits five applications of qualifying size for the same species will receive a Specialist Certificate and patch. An angler who submits five applications of qualifying fish of different species will receive a Master Certificate and patch. Catch 10 or more qualifying species of fish within the year, and the angler will earn an Elite Angler Certificate and patch. To apply, go to: NJFishandWildlife.com/pdf/skflangapp-salt.pdf. The New Jersey State Record Fish Program requires a separate application and is based on weight alone. Scale certification ­documentation and a weighmaster’s signature are necessary. Other rules apply. Visit Fish and Wildlife’s website at NJFishandWildlife.com for a complete list of current state records.